The Funky Felter: As promised . 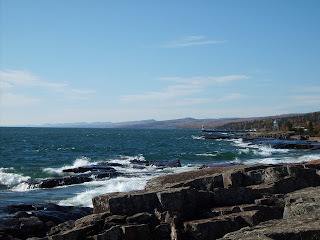 . . some photos from my recent vacation to Lake Superior's North Shore in Minnesota! As promised . . . some photos from my recent vacation to Lake Superior's North Shore in Minnesota! Well, my husband finally downloaded our photos from a recent mini vacation that we took to Lake Superior's North Shore area in Minnesota. We also stopped for one day in Minneapolis to check out the Midtown Global Market where I'll be participating in the No Coast Craft-o-rama in December. We had a wonderful time on vacation and plan to go back for another one in the Spring if our budget and time permits. I'll try to put some simple captions on the photos for you. Enjoy! 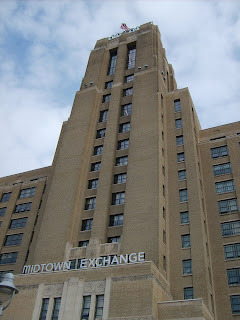 This is the Midtown Global Market building where the No Coast Craft-o-rama will be held in December. It is a really cool building and a very neat ethnically diverse market. We bought a candle and some soap there that were handmade. It rained most of the time on our trip and was quite cool too. 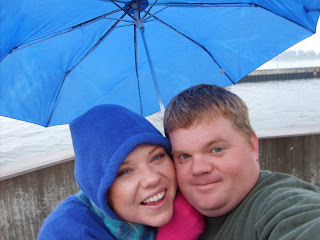 Here you can see us overlooking Lake Superior in the rain. We're standing on the walkway of a lighthouse in the port at Duluth. 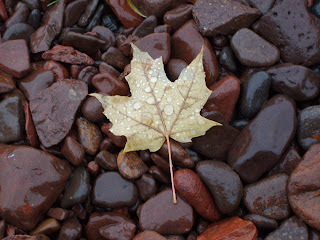 This is just a leaf on the wet rocks at the Glensheen Mansion in Duluth, but I thought that it was very pretty! 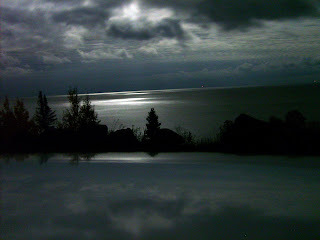 This is a photo that overlooks Lake Superior at night. I had to set the camera on our car hood and set the timer to get the photo to turn out. Then I also lightened it a bit in Photoshop, but I think it came out really cool! These two photos are at Gooseberry Falls State Park. Although it was wet, muddy, and rainy, it was still a lot of fun hiking around the Falls. This is a photo off the shore of an artsy little town called Grand Marais. We spent a day there walking around and checking out their lovely galleries and gift shops. We also ate at the Angry Trout Cafe which I highly recommend. 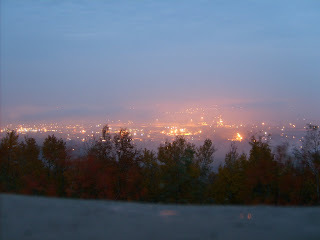 And, this is overlooking Duluth on a foggy night. I just thought it was a really nice photo to add. It is actually a very nice city with a lot of fun attractions and sites to see. That's our trip in a nutshell. We did a LOT more than I have shown you here, but I liked all of these photos and thought that they were interesting enough to share. We took over 200 photos on the trip so I had to be a little picky to say the least. I hope that you like the one's that I've chosen for you. Gorgeous photos. 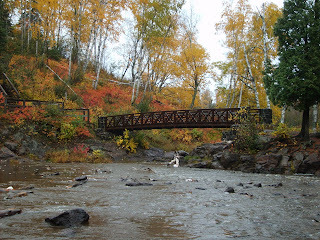 I have been to Duluth - such a lovely area! Oh yeah! I love "virtual tours" of people's travels! Fabulous photos! Those falls are beautiful! That photo of Lake Superior is really beautiful! Those are really beautiful pics. love that nighttime photo of the lake! Very cool!